It only makes sense that if you’re going to spend a certain amount of money traveling to shoot a film, that it would really only cost half as much if you went ahead and shot two films once you arrived on location. However, what makes sense for director Roger Corman, might not necessarily make any sense for the rest of us. 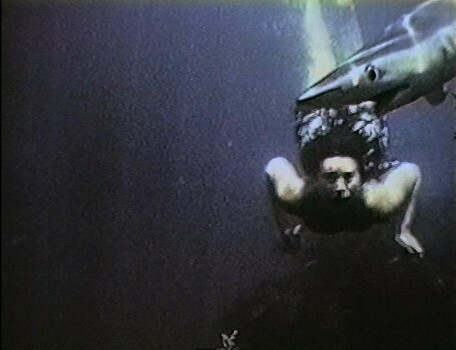 With She Gods Of Shark Reef, Roger takes advantage of the Hawaiian locations he used in Naked Paradise while simultaneously taking advantage of an unsuspecting audience. 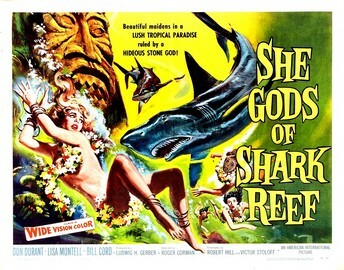 I certainly ascribe no malicious intent to Roger’s actions since he directed no less than fourteen different movies in 1957-58 and thus probably couldn’t even have told you he made a movie called She Gods Of Shark Reef, let alone anything about its origins, but dang it, at least he got a trip to Hawaii out of this deal! Simply put, She Gods Of Shark Reef is a must have DVD for any collector of tropical-themed movies. I mean, the DVD case is a must have. While Alpha Video’s release of the movie itself is so bad that it probably violates several United Nations treaties, no one can argue over its super cool cover. You’ve got a gigantic tiki idol grimly surveying a scene of a good looking blonde dame all trussed up and menaced by a monster-sized shark while a bunch of concerned native girls look on helplessly. Now, I’m no babe in the woods when it comes to these sorts of come ons, but I figured even if the movie is only remotely related to the picture, it’s going to be a keeper. Guess what? The only blonde in this movie was a guy! The “hideous stone god” (as it’s called on the front of the DVD) turns out just to be some junky-looking little thing down at the bottom of the ocean. There are sharks in this movie, but they’re about the size of a collie and the native gals don’t have much trouble stabbing them when they need to. I also don’t recall there being any “She Gods” in this film, though there was an ugly old woman in an ugly flower print dress who spoke of an angry God and taboos and the Island Company. The Island Company? What was that all about? The movie wasn’t called The Island Company Of Shark Reef, so why was I hearing about that? The Island Company turns out to be the organization that owns the island where this Shark Reef is located and the Company is responsible for all the island girls who live there collecting pearls for it. Every so often a supply ship shows up, but other than that, these gals look to be left to their own devices. None of this made much sense of course, since despite their supposed isolation the old bag would periodically raise and lower a color coded flag with such messages as “send police” and “shark god is angry – send sacrifices ASAP.” Where were these people at that they could see these little flags, but couldn’t come and pick up our shipwrecked studs for ten days? Oh, and you know that in a movie where an island full of hula girls are pearl diving that you’re going to have some shipwrecked studs turn up in clothes so tattered that they’ll have to spend the rest of the film in loin clothes that look like loud Hawaiian shirts. But they’re only going to be there for ten days, right? What sort of trouble can they possibly stir up in ten days? How about the kind of trouble that causes a stirring in their loin clothes? To be fair, that’s only the blonde one, since the dark-haired stud is too busy lamming out from the law for some murder he committed back on the Big Island (I don’t even know what that means, but I hear that phrase in every movie and TV show that revolves around Hawaii and I always wanted to use it) and drooling over the sack of pearls the girls have stashed away in one of their huts. The minimal amount of action that transpires is centered around the fact that the dark haired guy needs to get off the island before the police show up and the blonde haired guy is determined to take the native girl he’s fallen for with him against the old bag’s wishes. Circumstances force them to hang out on the Shark Reef (at least the movie comes through in that department) and even though everyone maintains how treacherous that area is, the dark haired one manages to swim to the island and back again. Even worse, the old bag manages to swim back to the island from the reef, too! I guess the Shark God was taking an afternoon nap during all this. Playing out at just barely an hour, it’s largely a toothless affair without anything very interesting occurring. Guys land on island, guys find boat, guys try to get off island, Roger remembers to throw in a shark attack near the end and while not able to compete with the scene in Corman’s Last Woman On Earth where a guy hit another guy with a fish, one guy in this one does whack the other over the head with the bag of pearls. Alpha’s DVD is horrible with the picture being so soft and blurry that it’s hard to make out details in some scenes, while the sound is even worse making it nearly impossible to understand all the dumb dialogue about angry shark gods. If I’m not going to get see angry shark gods, I at least would like to hear about them. It makes sense if you hipsters out there want to leave this DVD laying around in an effort to look knowledgeable about obscure tiki-trash, but under no circumstances should you contemplate entering these talk-infested waters.